Thomas Bell was the second son of James and Mary Bell. 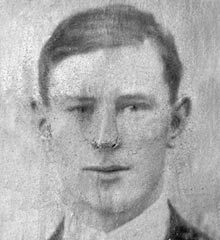 Thomas was born on 2nd September 1896 in the Coagh area. He was one of eleven children, seven surviving. All were born in the Coagh area. Sometime between 1907 and 1911 the family moved to Cookstown. Thomas worked as a weaver. 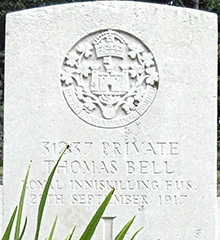 Thomas Bell enlisted with the 2nd Battalion Royal Inniskilling Fusiliers in Glasgow in January 1917. Private Bell was seriously wounded in September 1917 and was taken to hospital in Vuerne and died of his wounds there on 28th September 1917. Coxyde Military Cemetery is located approximately 500 metres beyond the village of Koksijde on the N396 towards De Panne. From Koksijde Dorp the N396, Houtsaegerlaan crosses the Zeelaan and at the same time changes its name to Robert Vandammestraat. 1 Km along the Robert Vandammestraat N369, on the right hand side, lies the cemetery.